The ETI 810-140 Therma-Hygrometer shows both the humidity and temperature in addition to indicating and recording the maximum and minimum readings. The external remote probe with integrated three metre lead the unit measures both temperature and humidity over the range of -20 to 70 °C and 10 to 99 %rh. The internal sensor the therma-hygrometer measures temperature over the range of 0 to 50 °C. The ETI therma-hygrometer is ideal for monitoring both temperature and humidity in rooms, offices, factories and much more. 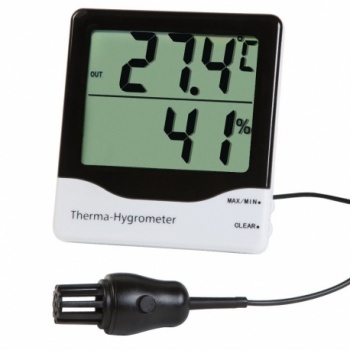 The ETI Therma-Hygrometer with internal & external temperature probe is in a plastic case, measuring 20 x 100 x 110 mm. This has a folding stand and a hole slot for hanging on a wall.